Tech & Learning Leadership Summits are attended by a select group of K-12 technology and teaching school professionals and education department leaders from districts across the country who understand and benefit from timely and relevant executive-level news about the successes and challenges of education technology. Each Tech & Learning Leadership Summit uses a combination of presentations and idea exchanges to focus on the challenges and success stories related to using education technology to support educational transformation. 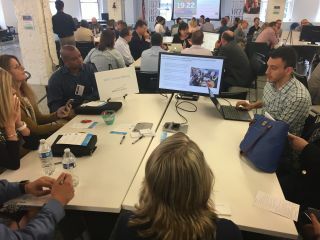 During the June 2019 Tech & Learning Leadership Summit, school leaders will experience a variety of inquiry- and project-based models, in addition to discussions about learning spaces, safety, funding, digital equity and citizenship, and more. Click here for more details! At the October 2019 Tech & Learning Leadership Summit, attendees will have the opportunity to listen to and share about the many ways districts are personalizing learning through innovative tech and curriculum. Click here for more details. During the December 2019 Tech & Learning Leadership Summit, attendees will have the opportunity to listen to and share the many innovative ways district leaders have worked to close the digital divide through innovative solutions. Click here for more details. PAST EVENTS: March 7-8 | Marina Del Rey, CA Theme: A District-Level Look at Innovation in K-12 Location: Marina Del Rey Marriott At the March 2019 Tech & Learning Leadership Summit, attendees will discuss innovative models of schooling, tech breakthroughs that will drive innovation, and what schools are doing to create the next generation of innovators. Click here for more details. Presenting timely and relevant content from the most authoritative speakers and advisors, along with unmatched networking opportunities, these two-day events are comprised of lively panel discussions and roundtables, one-on-one meetings, and networking-focused social activities. Speakers and discussions focus on K-12 leadership for tomorrow’s schools and the impact of emerging technologies such as mobile and cloud computing, immersive and virtual environments, and more. Each Summit will use a combination of presentations and working sessions to focus on challenges and success stories related to technology-supported educational transformation.